The Ethicurean philosophy is simple: eat local, celebrate native foods, live well. The Ethicurean is quietly changing the face of modern British cooking:- all from a walled garden in the heart of the Mendip Hills. 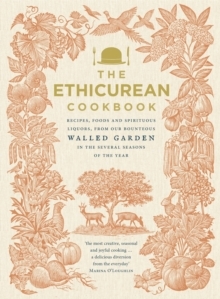 The Ethicurean Cookbook follows a year in their magnificent kitchen and garden,- and celebrates the greatest food, drink and traditions of this fair land. The combinations are electric: confit rabbit is paired with lovage breadcrumbs, cured roe deer flirts with wood sorrel, and foraged nettle soup is fortified by a young Caerphilly. The salads are as fresh as a daisy: honeyed walnuts nestle amongst beetroot carpaccio, rich curd cheese is balanced by delicate cucumber. And the comfort of pies and puds - pork and juniper pie, Eccles cakes with Dorset Blue Vinny- - is only enhanced by the apple juice, cider and beer poured in equal measure. With 120 recipes and a year of seasonal inspiration in photographs and words, Ethicureanism is a new British cooking manifesto.